Sometimes it's not easy being a goat. Like when you get accused of being a black magician, stealing a car, and being thrown in the slammer. But yesterday, we met a goat that got demoted (de-goated?!) from his post in the British Army. And career woes pale in comparison to the plight of today’s luckless ruminant, that was accused of stealing a car and tossed in the slammer. It’s not easy being a goat. In 2009, a vigilante group showed up at a police station in the Kwara state of Nigeria with a black and white goat in tow. 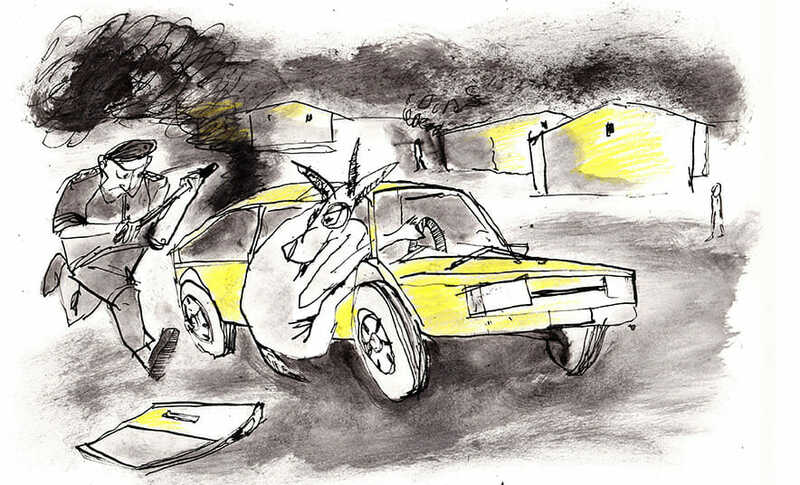 The goat, they said, according to BBC news, had stolen a car. A Mazda 323, to be exact. Well, not the goat exactly, but the man that had used black magic to turn himself into a goat in order to evade suspicion. (Belief in witchcraft is common in Nigeria.) The police took the goat in. He went on to say he could not confirm the story. In conflicting statements, one police spokesperson told the media that the goat was an “armed robbery suspect” being held until the investigation was complete while another said that they were holding the unfortunate animal until it’s owner showed up to claim up it.